"This chicken dish baked with marinated artichoke hearts and mushrooms is so delicious, people will think you spent hours in the kitchen!" Poke holes in both sides of the chicken breasts using a fork, and lay them in a baking dish. Pour the cooking wine over. Cover with artichokes and the artichoke marinade. Sprinkle mushrooms over. Bake for 35 minutes in the preheated oven, or until chicken is no longer pink, and the juices run clear. 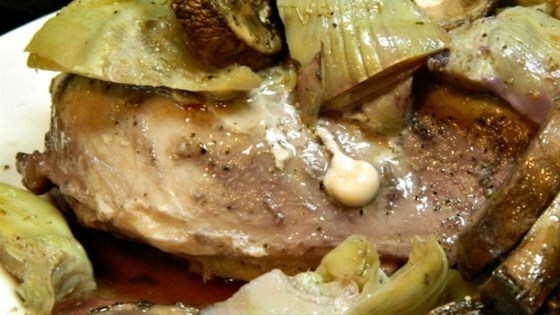 Baked chicken with a cheesy, creamy sauce and artichoke hearts. Delicious, easy recipe! I fixed w/brown rice and steamed asaragus. Next time, I might add a little fresh garlic for a little extra kick. People! Read and follow directions!! It calls for RED COOKING WINE, not sherry. Those are two totally tasting liquids. Also, use MARINATED, undrained artichoke hearts.